Home » Types of Fibroid Tumors – What Do Those Names Mean? Share the post "Types of Fibroid Tumors – What Do Those Names Mean?" Types of Fibroid Tumors – What Do Those Names Mean? Whether you’ve been diagnosed with a Uterine Fibroid, or your doctor suspects you have one, no one likes to hear that word “tumor.” Its probably why doctors usually leave that word out when discussing the presence of a fibroid tumor. But, if you’ve heard fibroid or fibroid tumor, you’re probably searching the internet for more information. Following are common questions and supportive information on fibroids, and fibroid types, as well as their related symptoms. As with any health issue, your best step is to speak to your doctor to obtain more information, but being armed with questions before that discussion can make you feel more in control of your health. These tumors are muscular growths within the walls of the uterus (also referred to as the womb). The different names indicate how the fibroid is positioned, and that location determines how or if you’ll have symptoms. 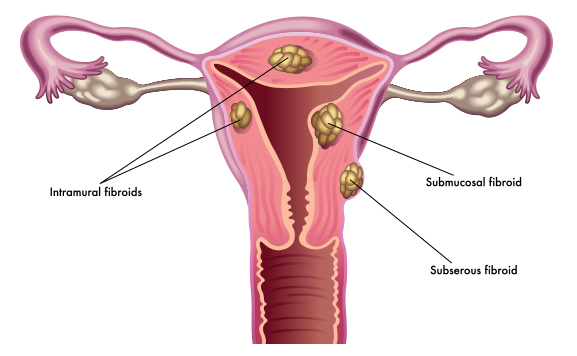 Fibroids are almost always benign (meaning non-cancerous). There is a very small (1 in a 1,000) chance that a fibroid tumor is cancerous. When they are, they are referred to as leiomyosarcoma. Existing non-cancerous fibroids do not become cancerous, and having fibroids does not increase your risk of cancer. What are treatment options for fibroid tumors? These fibroid tumors grow on a stalk. If you think of a stalk of broccoli, you’ll have a good idea of their appearance. The danger with this type of fibroid tumor is that the stalk, which is attached to the uterus, can twist, which cuts off blood supply to the tumor itself and can cause severe pelvic pain. Diagnosed with fibroids? Learn more about uterine fibroid embolization. Call (800) 311-5840 today! The U.S. Government’s Office on Women’s Health site has a great amount of information and even a handy list of questions to ask your doctor if you’ve been diagnosed with a fibroid. 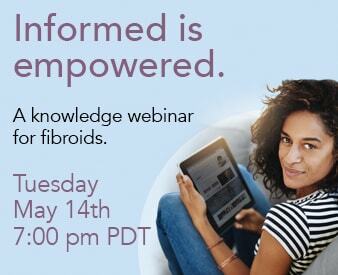 Getting the information on fibroids you need, to make the right health decisions for you, is important. Talk to your doctor, and understand that uterine fibroids are common, and treatable.